Biodiversity on planet Earth is under momentous threat, with extinction rates estimated between 100 and 1,000 times their pre-human level. The Mediated Matter group has been in search of materials and chemical substances that can sustain and enhance biodiversity across living systems, and that have so far endured the perils of climate change. Melanin is one such substance illustrating biodiversity at the genetic, species, and ecosystem levels. Melanin, a natural pigment found in most organisms, is a marker of evolution. It is known as the "universal pigment" found in skin, hair, and eyes, as well as in feathers and wings. It has been found in fossils from some 160 million years ago and today can be chemically synthesized with modern techniques. Reaction between the enzyme tyrosinase from mushroom Agaricus bisporus, and the amino acid L-tyrosine, over six hours. 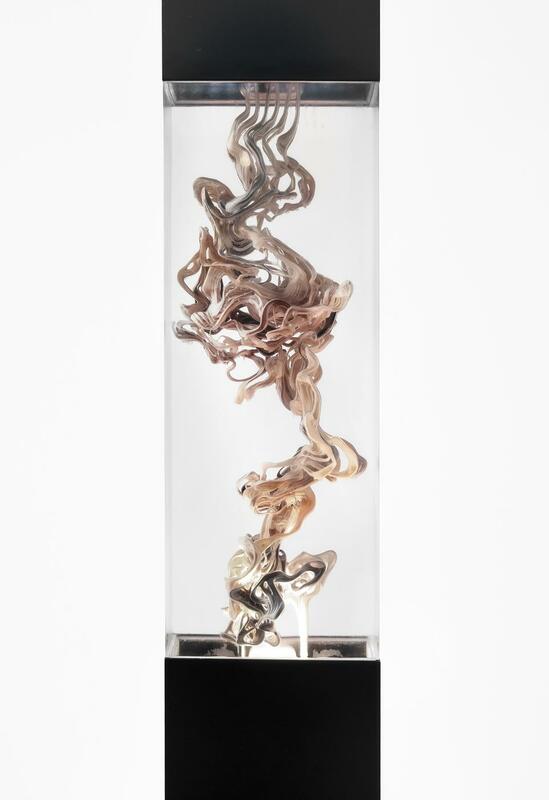 As oxidation and polymerization occur, larger and darker compounds are created, generating movement and color within the vessel. It represents unity in the diversity of life. Melanins are a group of pigments which range in color from yellows to browns. The term ‘melanin’ often refers to eumelanin, which is one type that is brown-black in color. However, other types, such as pheomelanin which is yellow-red, also exist. This library represents the diversity of color across melanins . 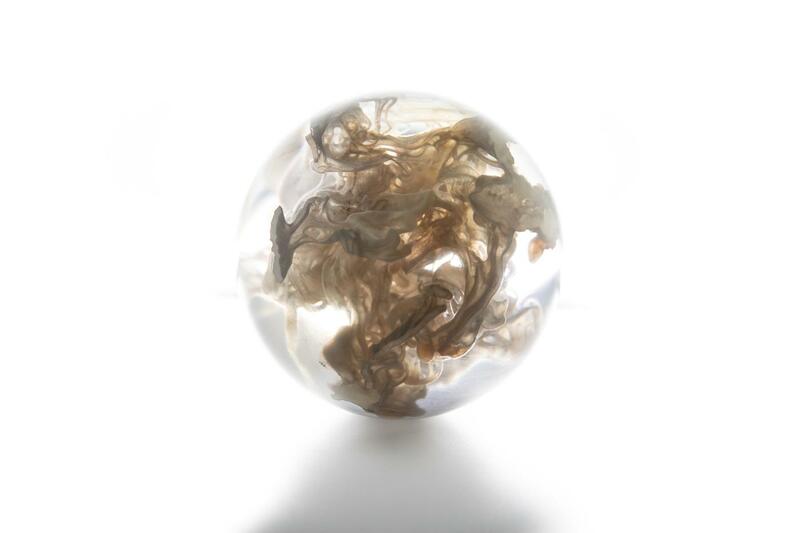 It includes constituent components of the reaction as well as melanin-containing natural materials, such as feathers and cuttlefish ink. Each liquid pigment can be studied using different analytical techniques, including UV Vis spectrophotometry. Different compounds have specific peak absorbances, which can be used to distinguish them and verify the presence of a particular substance. 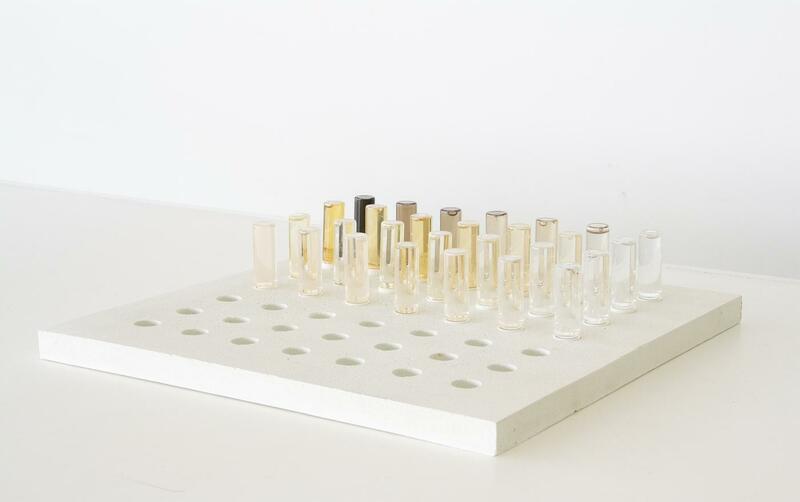 Our project seeks to address and speculate upon designers’ ability to chemically synthesize the "pigment of life"—literally and metaphorically—and program its interaction across scales and species. The technical goal is to understand, explain, and predict how melanin can, along with other derivative pigments, be generated on demand; the environmental and human factors involved in its creation; and how its formation can be tuned or even reversed to sustain and perpetuate diversity on our planet. 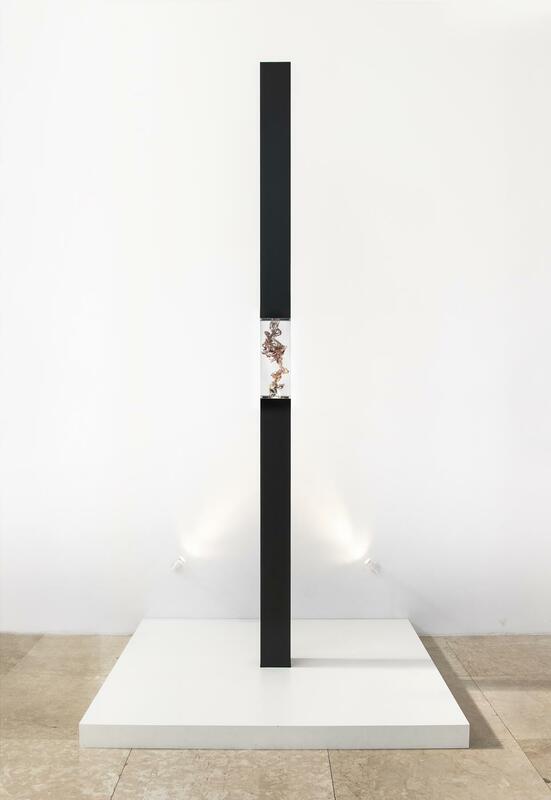 Central to Totems is the study of how melanin is created in nature, and how the process can be translated into a design tool. 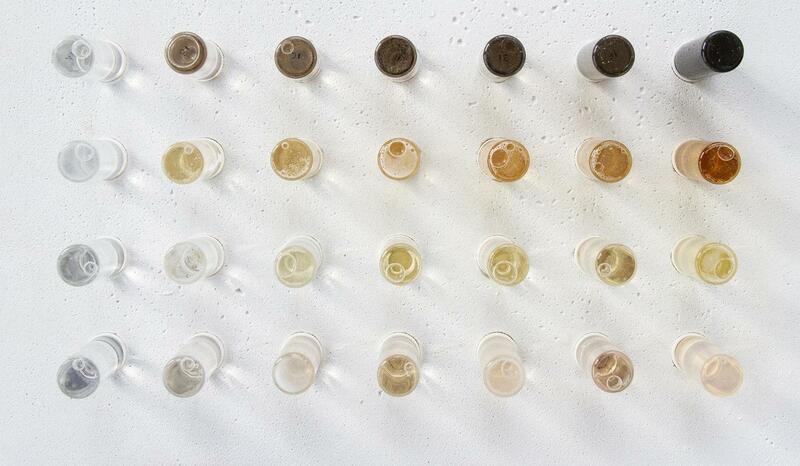 Each experiment shown here elucidates a variable that can be tuned to impact biochemical activity and therefore, color. Where does the melanin for this installation come from and how is it extracted? 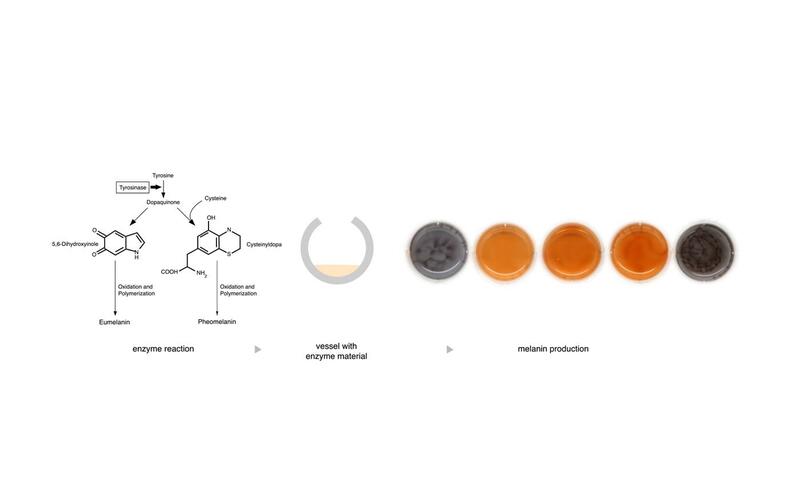 In preparation for this project, we studied the biosynthesis of melanin in the natural world and then translated the process into a set of chemical design protocols in our lab. Melanin substance was created in two ways. In one, a reaction between an active chemical, the enzyme tyrosinase—which was extracted from the Agaricus bisporus mushroom—converts a protein building block, the amino acid tyrosine, into melanin and its precursors. These pigments can be deployed in liquid or powder form to create unique, environmentally sensitive inks that are printable in two- or three-dimensions. Diagram illustrating the enzymatic reaction that yields melanin of two forms: eumelanin (brown-black) and pheomelanin (red-yellow). In another method, pigment is extracted from bird feathers and cuttlefish ink, then purified and filtered in a series of steps. Feathers often contain a range of melanins, which can be extracted through chemical breakdown and subsequent filtration, as shown here. The pigments have a variety of functions, from strength and durability to coloration. In addition to chemical methods, melanin can also be obtained through different species of microorganisms. The genes for melanin production can be engineered into bacterial species, such as Escherichia coli, and thereby controlled over space and time in response to changes in the environment. For instance, the coloration could deepen as the sun reaches its peak each day, providing protection from solar radiation. 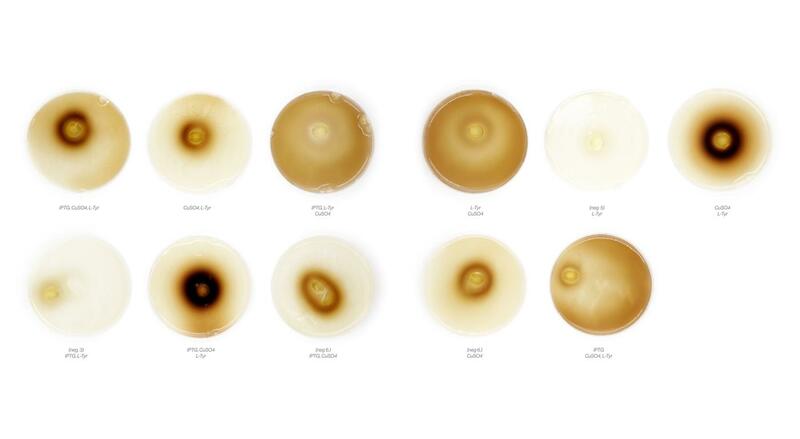 Here, a bacterial strain was engineered and can now be tunably induced in interaction with 3D printed material to produce different amounts of melanin. This strain was engineered by Meng & Voigt at the MIT Synthetic Biology Center. 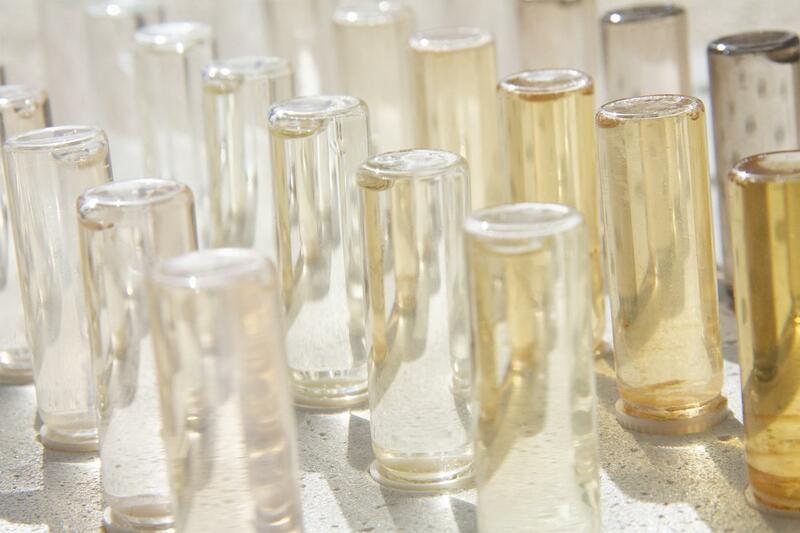 We have developed methods for the design of structures that can contain biological substances across scales (micro to macro) and phases (solids and liquids). 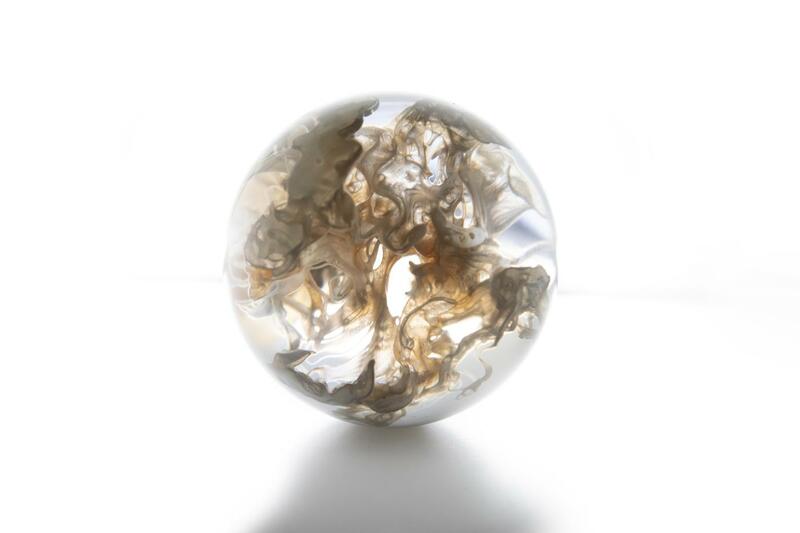 As part of the basic research underlying Totems, we created a series of spherical objects featuring a single connected channel filled with liquid melanin. 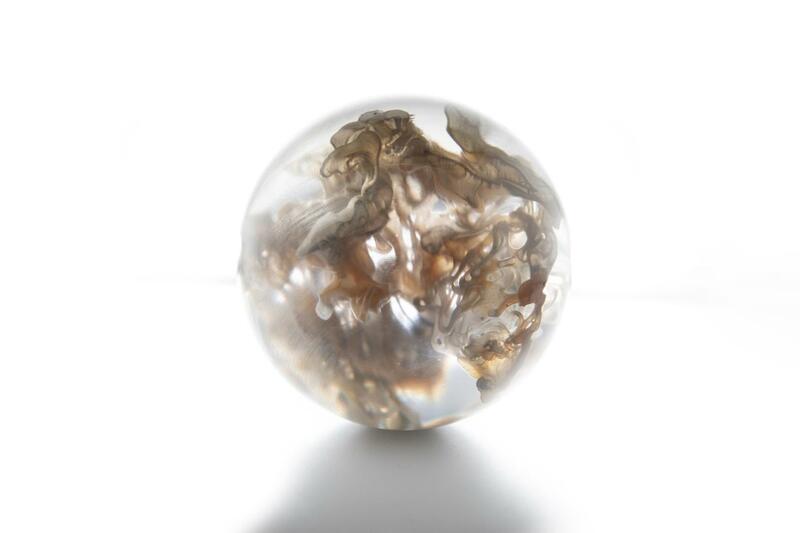 These "orbs" display a wide range of colors and therefore absorption spectra, from light to dark. The channels have been computationally "grown" to create pockets with channel diameters ranging from millimeters to centimeters. 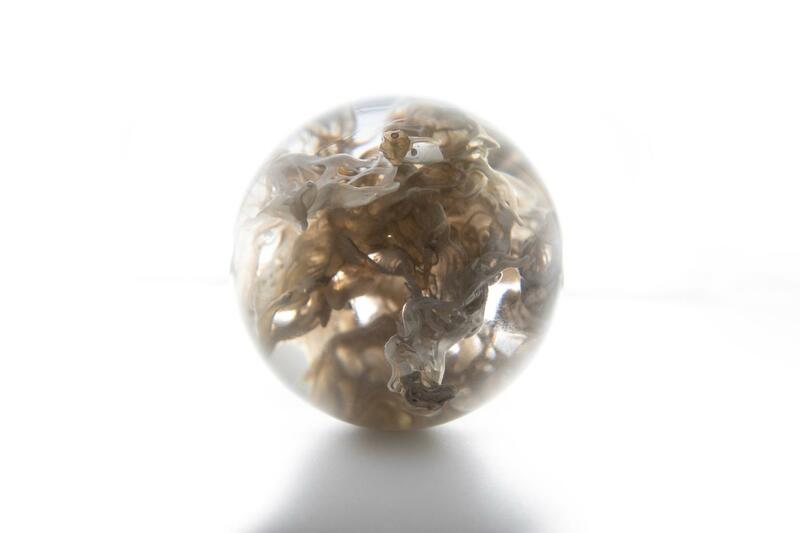 Melanin can also be incorporated into designed products, such as a 12cm sphere shown here. 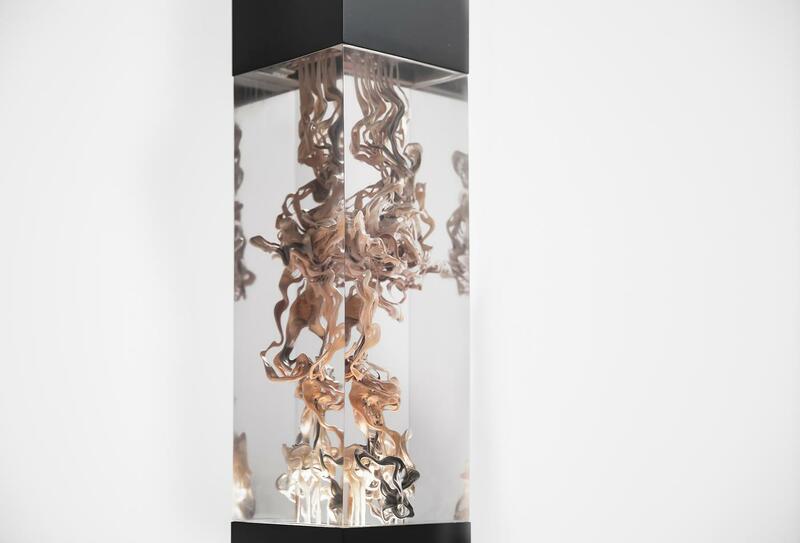 The internal geometry and material distributions of each piece are computationally grown, 3D printed through high-resolution multi-material 3D printing and finally augmented with melanin. The generative growth process uses geometric rule-sets to create pattern formations seen in biological processes and allows to evolve the rule-sets towards particular performance criteria. 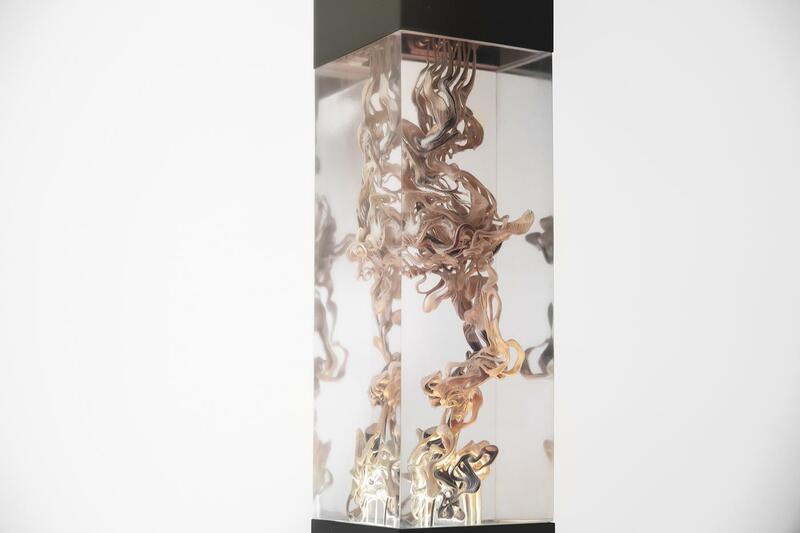 Generated forms are then physicalized using a multi-material 3D printing process leveraging volumetric material descriptions that are interpreted to high-resolution material deposition instructions to generate intricate cavities, patterns, and channels in the spheres. These channels are then filled with five different hues of melanin, drawn from different sources - from cuttlefish ink to mushrooms to bird feathers. In an age when we can engineer melanin, who owns biological color? What are the biological and cultural implications of these new capabilities? What are their promises and their perils? 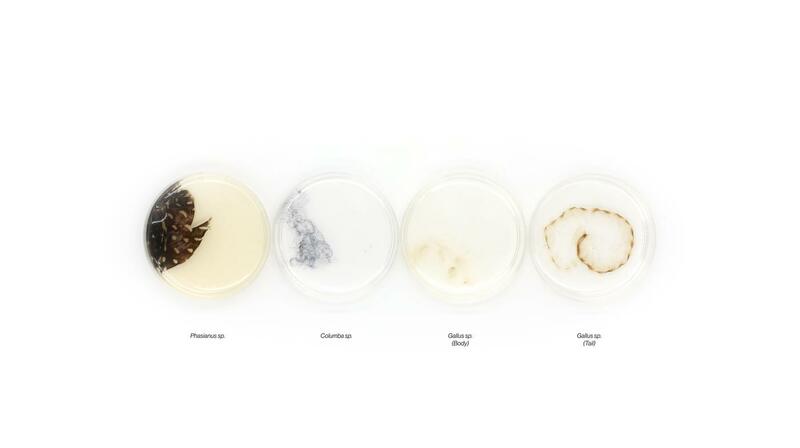 This research investigates the long and crucial intersection between culture and nature by questioning the dichotomy between the societal and biological roles associated with designers’ abilities to engineer melanin’s expressions within and across species. Through this investigation, we question our ongoing relationship with biology and natural history.